Team Chevy and Wayne Taylor Racing’s Jordan Taylor drove his No. 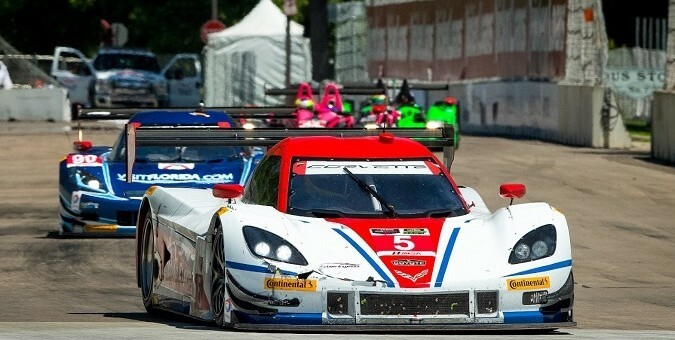 10 Konica Minolta Chevrolet-powered Corvette DP to a win at Road America Saturday, helping lock in the championship in the Prototype class for Chevrolet. Action Express Racing’s Joao Barbosa and Christian Fittipaldi also managed to come in second behind Taylor, giving them enough points to secure the driver’s championship for themselves and Chevrolet. Four Prototype teams campaigned Chevrolet Corvette DPs this year – Action Express Racing, Wayne Taylor Racing, Spirit of Daytona Racing and Marsh Racing. Corvette DPs swept the top three positions at the season opening Rolex 24 at Daytona and locked in another five victories throughout the season. Corvette Racing, which also participates in IMSA competition in the GTLM Class, wasn’t as happy following Saturday’s race. Despite a hard-fought battle over the course of the eight-hour endurance competition, Corvette Racing’s No. 4 and No. 3 C7.Rs turned up fourth and eighth, respectively. Going into the race, Corvette Racing’s Antonio Garcia trailed SRT Motorsports’ Kuno Wittmer and Jonathan Bomarito by only seven points in driver’s championship. The result on Saturday, which saw Wittmer’s Viper score a third place finish, ultimately locked in the driver and manufacturer’s championship in GTLM for SRT. This year marked Corvette Racing’s first full season with their C7.R racecar and despite losing out on first-place finish, the team put forth an admirable effort for having an all-new car. The yellow Corvettes will be back next year – hopefully even stronger, looking for the C7.R’s first championship. They’d better get busy though, as were sure there is lots of work to be done before the season opening Rolex 24 at Daytona on January 9, 2015. Looking forward, the Corvette DP cars may have won, but the program is anticipated to be cancelled by 2016. Corvette Racing, meanwhile, may take racing efforts to a more global level, with expectations to participate in more FIA World Endurance Championship races soon. The series was ruined when it was merged with the Daytona prototype’s etc. Amazing how they screwed over the existing Lemans car teams. The Daytona prototype couldn’t even get close to their times in previous years. Nascar ruining everything from IndyCar to sports cars to American superbike. Well road racing is a tough series to keep relevant. The cost in road racing is extremely high and the media/TV coverage is not all that good. For people like me who love this type racing we put up with the odd hours and limited coverage. But for most that watch racing they want it to not only be competitive but entertaining. This is why NASCAR has done better than most series. But the cost is the major issue. ALMS was a great series but the cost ran off most MFG and the private teams had a hard time fielding efforts. Even in the old days of IMSA they used to say to win a Million dollars in IMSA you take 15 million and go racing. The Daytona series was a compromise to help bring in more MFG again and retain cost while making a balanced and competitive field. No MFG wants to be at a disadvantage in a series. Even now after the Viper team won the championship they are now getting pulled out due to high cost for how few cars they are selling. GM is not happy with the penalties on the Corvette as they had this series wrapped up till they were given the weight penalty that was too much to keep them in the hunt. The truth is pure racing is no longer around as no one wants to spend a lot of money and not be competitive. Road racing is a tough nut to crack as it has a lot of cost and so little return many companies have a hard time getting it approved in the budget. I was around for al l the great times in the IMSA series in the 80’s as MFG money was everywhere. One series to watch is the new Trans Am series as they are proving to be getting stronger and more competitive. I have been to it the last two years and they put on a hell of a show with a lot of cars and little factory involvement. I have a very competitive TA team just down the road and one of the top teams near by that do an outstanding job. They stated around 60 cars at Mid Ohio this year. what other series with no major support has done that.? Chrysler pulls plug on SRT racing team?? ?